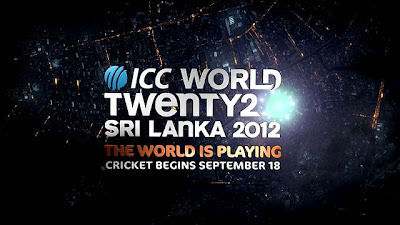 It is World T20 Time Again! We are less than a week away from the 4th edition of the ICC World Twenty20. Teams have started landing in Sri Lanka, and the hype is building up for the warm up games that start tomorrow. The World T20 is by far the most entertaining cricket event in my opinion. It surpasses the ICC's flagship event - the World Cup, and it also surpasses the IPL, which according to some is more entertaining. For me its the World T20. Nothing beats watching the top cricketing nations battling on the field for T20 supremacy. The length of the tournament is just perfect unlike that of the World Cup and the IPL, which go on endlessly for almost two months. The number of matches played is also just right, whereas the other two tournaments start feeling like a drag before you get to the business end of the tournament. Moreover, the format of the World T20 ensures that almost every single match is meaningful, unlike in the World Cup and the IPL, which have plenty of meaningless matches, one after the other. So what are you expecting from this year's World T20? Here are some records, stats, and facts from T20 internationals and the World T20. The ICC rankings say that South Africa is the best T20 team in the world. Based on the overall performance in T20 Internationals, it is also South Africa who has the best W/L ratio and highest Win % among all T20 teams taking part in this year's World T20. But are they the favorites to win it this year? I would never rate South Africa as one of the favorites for any tournament. They might be the top ranked side in all formats of the game (or not), but they still have to learn how to win World Cups. They just can't do it. 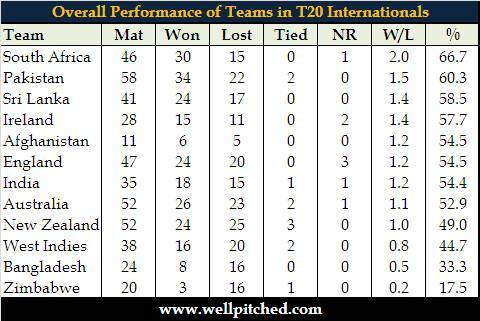 Pakistan, the team with the second best W/L ratio and second highest Win %, are one of the best T20 teams around. Pakistan have been the winners, runners up, and losing semi finalists in the last 3 editions of the World T20. No one can rule them out surely. 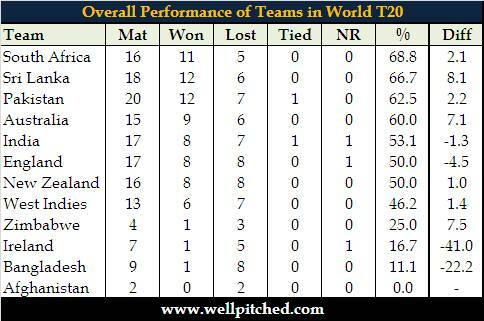 South Africa are also the best team when it comes to World T20s, with the best Win % among all teams. Yet they have not made it to the final even once in the last three editions. "Diff" in the table below shows the difference between the teams' win percentages in all T20 internationals and World T20 matches. Ironically, Pakistan is one of the consistent teams whose performance is at par with their overall performance in T20Is. Sri Lanka and Australia are among the teams that have a stark improvement in their performance in World T20s as compared to their overall T20I record. While England and India are among the teams whose performance has deteriorated in World T20s. So purely on a statistical basis, I'd say that South Africa, Australia, Sri Lanka, and Pakistan are the front runners to win this World T20. 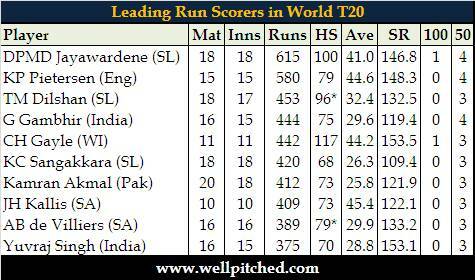 Two of the three leading run scorers in T20Is are not going to be part of the World T20 this year. While Kevin Pietersen is at war with the ECB, Graeme Smith has been left out of the South Africa squad. 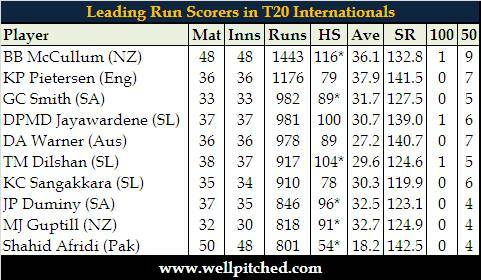 Sri Lanka's top 3 batsmen are all among the top run scorers in T20Is. With the World T20 being played on their home turf, Jayawardene, Dilshan, and Sangakkara are going to be a force to reckon with. New Zealand's opening pair also feature among the run leaders, with Brendon McCullum sitting at the top of the pile. With both KP and Smith out of the race, watch out for McCullum to widen that gap between him and the rest of the run scorers even further. 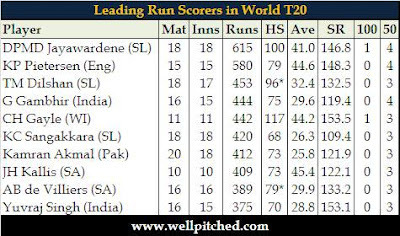 The Sri Lankan trio of Jayawardene, Dilshan, and Sangakkara are also among the leading run scorers in World T20 matches. 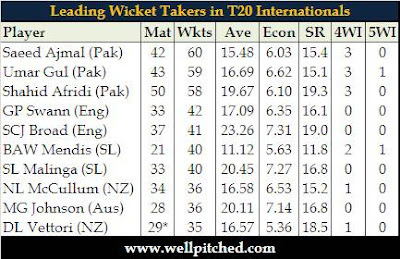 Shahid Afridi's absence from the three T20s against Australia in Dubai allowed Saeed Ajmal and Umar Gul to over take him and become the top two wicket takers in all T20Is. Pakistan undoubtedly has the best bowling attack among all teams in T20 cricket at the moment, and the presence of Ajmal, Afridi, and Gul ensures that you can never count Pakistan out. 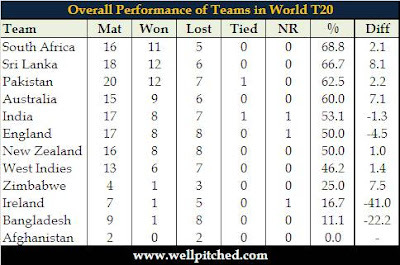 It will be interesting to see, which one of the three ends the World T20 at the top of this list. Afridi, Gul, and Ajmal are at the top of the wickets pile in World T20 matches also, further cementing Pakistan's position as one of the favorites for the title. 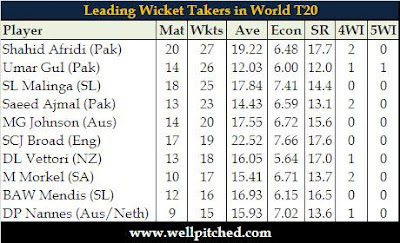 The presence of Malinga and Mendis in leading wickets takers in T20Is overall, as well as, World T20 matches, along with the batting trio mentioned above increasingly makes Sri Lanka look like an extremely dangerous side. Even though they have managed to pick themselves up for World T20 Championships, Australia have always been a below par T20 team. The last time they won a bilateral T20 series was against the West Indies in February 2010. In the 31 months since then, they have played 10 T20 series, drawing 5 and losing 5. India has played four T20Is against New Zealand and have never beaten them. Including the 1 run loss last night. Pakistan had had three different captains in each of the last three editions of the World T20, and they have a different one for this year's World T20. Shoaib Malik captained in 2007, Younis Khan in 2009, Shahid Afridi in 2010, and Mohammad Hafeez now. In contrast, India has played all the Word T20s and will play this one under MS Dhoni. 7 Batsmen have hit centuries in T20Is. 3 of them - Gayle, Jayawardene, and Raina - have done so in World T20 matches. Chris Gayle's 117, equaled by Richard Levi of South Africa, is the highest ever score in a T20I. Shahid Afridi is the most experienced T20 Cricketer with 50 matches to his credit. 6 of the 10 most experienced T20 cricketers are Pakistanis, and 5 of them - Afridi, Malik, Gul, Ajmal, and Kamran Akmal are part of the Pakistan's squad for the World T20. Surely the experience will count for something! Shahid Afridi has won the most man of the match awards in T20Is - 7. KP and Jayasuriya follow him with 6 each, but they won't threaten Afridi's record at the top. Gayle and McCullum have won 5 MoM awards each and they are in line to equal or surpass Afridi during the World T20 given their prowess with the bat. 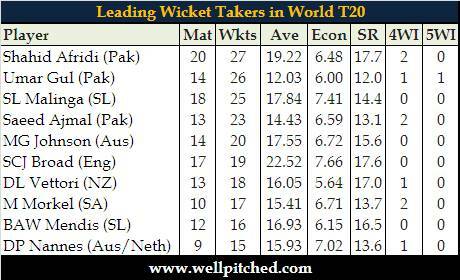 Ajantha Mendis' 6-16 against Australia in August last year are the best figures by a bowler in a T20I. 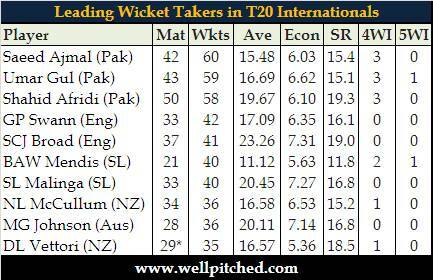 Umar Gul's 5-6 against New Zealand in 2009 is the only 5 wicket haul taken by a bowler in World T20 matches. MS Dhoni has scored 587 runs in 31 T20 innings at an average of 30.9 and a strike rate of 109.5, with no 50s or 100s. Misbah Ul Haq has scored 788 runs in 34 T20 innings at an average of 37.5 and a strike rate of 110.2, with 3 50s. One finds himself axed from the team, while the other is leading his country. 15. Kami hai Right Choice Baby! Kamran Akmal is the leading wicketkeeper in T20Is in terms of dismissals - he is miles ahead of all other keepers with 47 dismissals in the 41 T20Is that he has played. The next in line are McCullum (28 in 48 matches) and Sangakkara (28 in 35 matches). 16. Kami sach me hai Right Choice Baby! KP's 348 runs in 8 T20I innings against Pakistan is the highest number of runs by any batsman against an opposing team in T20Is. How sad that he can't sort his differences out with the ECB. 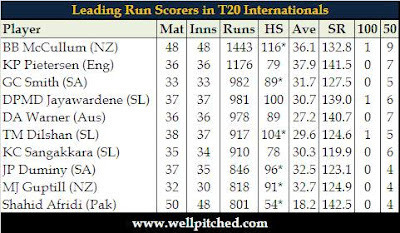 In his absence, the player taking part in the World T20 with the most number of runs against one opposition is Kamran Akmal. His 303 runs in 9 innings against Australia is number 2 on the list, right behind KP. Matthew Hayden retired with a T20 average of 51.33! Symonds was booted out of the Australian team while he had a T20 average of 48.14! Symonds' average is the highest average for a batsman that has played a minimum of 10 T20I innings. Jacques Kallis and Alex Hales, both with averages of 39+, are the ones with the highest T20I averages in the World T20 this year. All these players mentioned in this piece have the potential to light up a cricket field single handedly. All of them are in Colombo gearing up for the World T20, which gets underway on 18th September. With all this fire power in one place, the tournament promises to be a cracking event. I can't wait for it to start already.